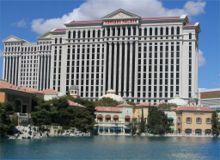 Caesars Palace is probably the worldâ€™s best known resort-casino, celebrating the grandeur that was Rome, in an 85-acre destination location that sets the standard for entertainment, dining and luxury. Reigning at the heart of the Las Vegas 'Strip', Caesars Palace ranks among the worldâ€™s top luxury resorts known for its originality and beauty. Located on the Las Vegas Strip, this elegant resort features the famous Garden Arena concert and sporting venue. A casino and tropical-inspired pools are also available. 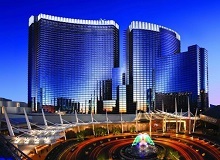 MGM Grand boasts a full-service spa while the pool areas provide private cabanas and a lazy river. Nightly entertainment from performers like KÃ€ by Cirque du Soleil , David Copperfield, and the new nightclub Hakkasan are on site. 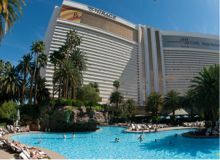 The Mirage is the legendary Las Vegas mega-resort offering the ultimate in playful relaxation and seductive exhilaration. Situated in the centre of The Strip the hotel offers chic amenities and superior customer service. Enjoy The Mirageâ€™s guest rooms and suites, featuring stylish comfort complemented with ultra-modern amenities and elegant upgrades. 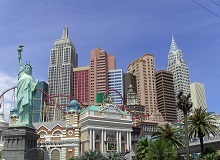 Fronted by replicas of the Brooklyn Bridge and the Statue of Liberty, this New York-themed hotel recreates Manhattan's skyline along the Las Vegas Strip. All 2,023 guestrooms and suites of New York New York Hotel are housed in 12 New York-style skyscrapers with replicas of Greenwich Village.